This book is a pictorial record of a few generations of the Maxwell family from the 1860s up until the 1950s. The material relating to the Farnhams which is now held by Cavan County Museum arrived in two instalments.. The first came in 1999, as part of a donation made by the twelfth Baron Farnham, and mostly consisted of books and some photographs. The second instalment, a much larger one, was donated following Lord Farnham’s death in 2001. Some years later, his widow bequeathed items which she felt to be of historical value and of interest to the local community. 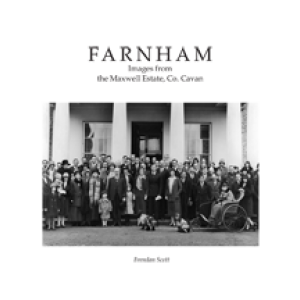 Much of the material donated by Diana, Lady Farnham, and her late husband is now on show in Cavan County Museum. This publication is designed to display images of the Farnham family that would otherwise remain unseen. The ‘character’ photographs presented are both posed and informal. The posed photographs allowed the Farnhams to choose the way in which they presented themselves to the public, and as such can be rather stilted, whereas the informal shots reveal the family in all manner of relaxed poses in many settings, from their gardens to holidays abroad; the more recent the photograph, the more informal they tend to be. Overall this publication is a rich source of pictorial material relating to a time and way of life now long past in Ireland.